Yes, I realize that this is a goofy picture. Should have seen the other one. For one of her Christmas presents, we gave Emma a "coupon" good for getting her ears pierced. Well, yesterday I decided to take her to actually do it. She was excited and a little bit nervous. I was impressed how brave she was and that she really didn't flinch or make much noise with the piercings other than saying, "Ow." For a kid who can be quite vocal about pain, that was quite amazing. She picked out studs of her birthstone. So far she's doing pretty well with them. I asked Molly if she wanted to get her ears pierced then since she has been talking about wanting them too. She surprised me by saying not then. 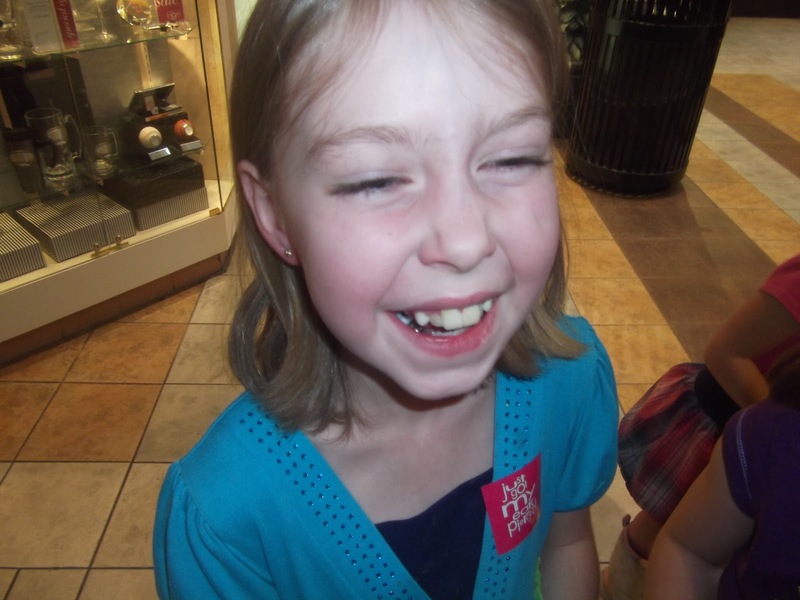 There was another girl there trying to decide if she wanted to get her ears pierced. Emma told her it wasn't that bad to get them done. As far as I could tell, the girl decided she wasn't brave enough to do it.